Here at Carisbrook we like to understand our patients. Many of our customers at Carisbrook Dental, from children to adults say they feel anxious before visiting the dentist as they are scared of needles (needle phobic) and don’t want to receive an anaesthetic. We wanted to help our customers overcome this fear and create a more pleasant experience for those dental visits. Pre-treatment anxiety is a common problem and one we have addressed with the introduction of The Wand. Carisbrook Dental was the first surgery in the North West to introduce this revolutionary new tool for anaesthetising teeth and gums. All our surgeries are equipped with The Wand machine and unlike other practices, we do not charge any extra for the system to our patients. So what is The Pain Free Wand? The Wand is a small hand held tool that looks like a pen, which delivers an automated dose of anaesthetic to the required area of the mouth. Working at a slow rate, The Wand operates at a low pressure to deliver pain free injections. Many patients remark that they did not feel the anaesthetic being administered when The Wand was used in their treatment. We also use bubble gum flavoured topical anaesthetic before using The Wand. This further helps the injection to be pain free and particularly helpful with our needle phobic clients. 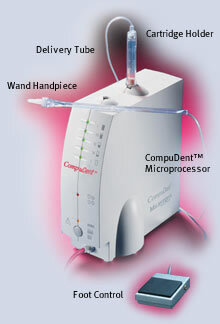 The Wand can be used for all routine dental treatments including crowns, fillings, cleaning and root canals. Why is The Wand better than the traditional syringe used by other dentists? The pain caused by injections with traditional syringes is created by the anaesthetic being delivered too quickly or with too much force. The Wand eliminates these factors by using an automated flow rate of anaesthetic at a controlled pressure for a comfortable delivery, ensuring that the procedure is not forceful or painful. Not only this, but The Wand also delivers a more targeted injection, so your lips and tongue needn’t be numb for hours after your visit to the dentist. Ask your dentist about The Wand today!